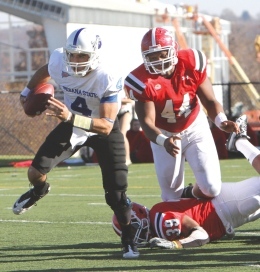 Andrew Johnson pursues Indiana State University’s Ronnie Fouch on Sept. 24. Johnson graduates this month with a bachelor’s degree in sociology. 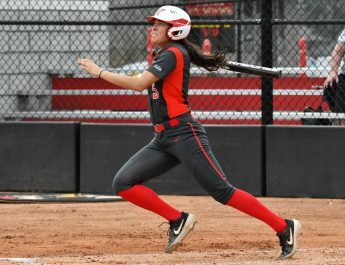 Photo courtesy of YSU Sports Information. When Andrew Johnson decided to transfer to Youngstown State University, he thought he needed a change. He said he made the right decision. Johnson, a transfer from Bowling Green State University, came to YSU to play football, but he also wanted to increase his grade point average. Head football coach Eric Wolford said Johnson’s recent academic successes were a result of his commitment. Johnson will graduate May 19 with a sociology major and a human resource management minor. In his senior season, Johnson started all 11 games for the Penguins, anchoring the defensive line. He finished with 39 tackles, 27 of which were solo. He also had 6.5 sacks and 11 tackles for a loss. His 6.5 sacks were the most by a Penguin in nearly 10 seasons. Johnson finished with two tackles and 0.5 sacks in the win against the then-No. 1 team in the country, North Dakota State University. The defense also recovered two fumbles. When Johnson was on the field, his leadership could always be counted on, Wolford said. Johnson said he has been studying for the GMAC, which measures a student’s aptitude to succeed in graduate business studies, and the LSAT, which assesses prospective law school candidates. Wolford said he’ll fondly remember his time with Johnson.